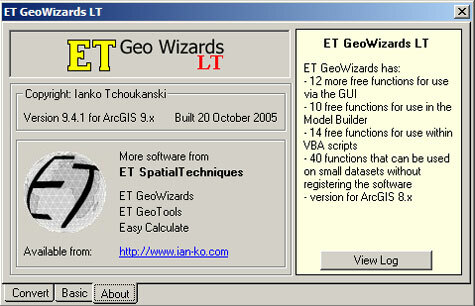 ET GeoWizards LT is a set of data processing functions for ArcGIS presented in a user-friendly, wizard type interface. It is not a sample or a demo. All 28 functions included are fully functional with no restrictions whatsoever. How about that!?! Talk about being responsive. Ianko went ahead and changed his extension to be completely free. Frankly I’m very impressed with his responsiveness and it shows how he listens to the GIS community as a whole. No other company has responded in my little blog other than him and it would have been so easy (I wouldn’t have blamed him) to say I’ll remove it when others do. So go download the updated extension and make sure you check out his website to see what the difference between this LT version and the full version is. Heck why not buy the software anyway and show him that you appreciate his work and his responsiveness.